DARONDO - LISTEN TO MY SONG-THE MUSIC CITY SESSIONS (180 G VINYL LP NEW! 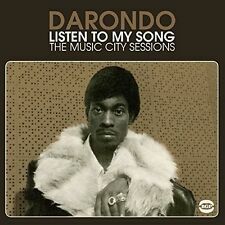 DARONDO - LISTEN TO MY SONG-MUSIC CITY SESSIONS CD NEW! MILT MATTHEWS "STOP THAT TRAIN c/w THIS IS MY SONG" NORTHERN / MODERN LISTEN! LOVE STAND OUT / LISTEN TO MY SONG FRENCH 45 PS 7"
This page was last updated: 22-Apr 19:24. Number of bids and bid amounts may be slightly out of date. See each listing for international shipping options and costs.